The Yamaha Clavinova CLP-675 digital piano is a stunning instrument that will impress even the most discerning and demanding pianists. Boasting linear graded hammers, the CLP-675's GrandTouch keyboard action reproduces the touch, feel, and dynamic range of a concert grand piano. Yamaha CFX and Bosendorfer Imperial grand pianos sing through the 210 watt, three-way speaker system, while Binaural CFX technology delivers an immersive headphone experience. 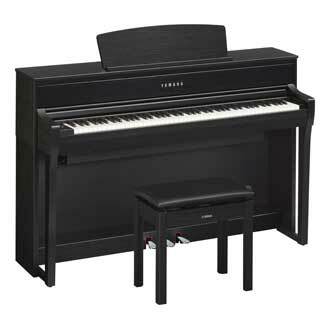 Other features include Bluetooth audio, synthetic ebony and ivory keytops, and practice and recording functions.